Judas Tree (Cercis siliquastrum): growing, planting, caring. Pink flowers and heart-shaped leaves - can it get cuter? Cercis siliquastrum - the Judas tree - is a small deciduous tree of the pea family Fabaceae, naive to Southern Europe and Western Asia. It is a small tree growing to 12 m (39 ft) tall, with cordate leaves and deep pink flowers, later turning into long flat pods that hang vertically. Small tree with deciduous foliage, rounded leaves, heart-shaped, alternate. Flowering is mostly pink, in sessile bunches. Flowering happens before the leaves emerge. Plant in well-drained, deep, fertile, cool soil, in the sun or partial shade. Planting bare root is not recommended, you can plant clumps and trees in containers from winter to spring. Plant in a hole at least 20cm larger than the root ball, gradually replace the crumbled earth, in the opposite order you extracted it so as not to mix the layers of the soil. Tamping regularly around the roots. Water just after planting with at least 50 liters of water that you pour into a bowl formed around the trunk. A stake planted in the hole, inclined, facing the prevailing winds, will be useful, provided you do not forget to remove it, and use a suitable flexible attachment. 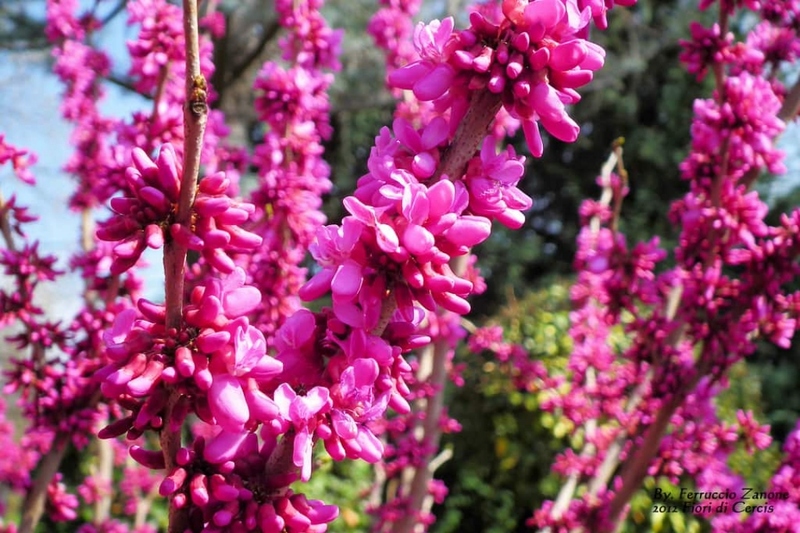 The judas tree do not spontaneously form a trunk, so if your tree is bushy and you want a tree, select a single vertical branch and cut all others. Always turn your pruner so that you have the blade against the side to be kept, because the other one will crush the bark. Trim the branches that come in and those that get tangled, after the flowering in May. If you want a judas tree with only one trunk, the first years in February-March trim all the side branches from the base, keeping only a few at the top. In the first month and in case of drought, water abundantly but not too frequently, so that the roots will fetch water deeper. Water thoroughly, until the soil is wet and a small puddle remains around the tree. Keep an eye on your plant during the first summer and water if needed. Some compost and mulch of wood or leaves placed at the base of your judas tree in early winter is beneficial.